This is one of those recipes most people would never post. I’m posting it because ALL my kids love it and I want them to have it when I’m not around. It is basically a stewed potato that is thickened with corn meal. I have NO idea why it is so good, but it is. Maybe it’s the memories it brings up. It is one of the things my kids remember the most about my mom, Granny Dot. Prepare the potatoes and just cover with salted water. Bring to a boil and cook until tender, 15-20 minutes. Meanwhile, in a small bowl, mix the corn meal and milk, mixing well. 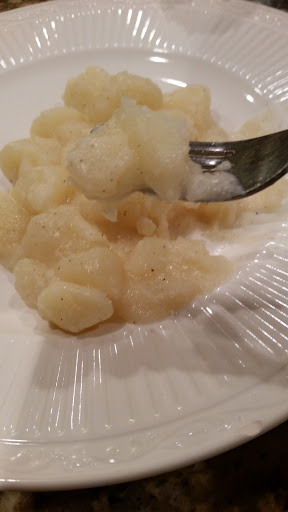 When the potatoes are cooked, add the butter, cornmeal, additional salt and pepper, and cook until thickened. That’s it! How simple is that?